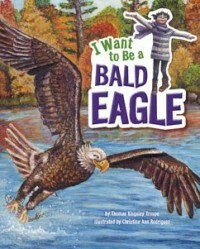 I Want to Be a Bald Eagle | Thomas Kingsley Troupe — Writer. Filmmaker. Action Hero. Ever wish you could soar like an eagle? Step into Heather’s life, as she transforms into the majestic bird. Take flight and learn all about a bald eagle’s habitat, body, superpowers, and more—all from a bald eagle’s perspective.